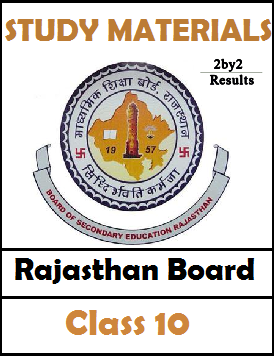 Rajasthan Board 10th Model question Papers - In this page, Students can download the Rajasthan Class 10th Model Question papers for all Subjects (English Hindi Sanskrit Science Social Science Sindhi Urdu) in this page. The RBSE (Ajmer Board) 10th Model Question paper provided here will be much useful to prepare for Class 10th annaual Exams. Already Rajasthan 10th Exam Time Table March 2018 is announced. Download RBSE 10th Model Question Papers using below links. In above Table, you can download the Rajasthan 10th Model Question paper for all subjects. below is the useful link which contains Rajasthan 10th Syllabus, Notes, Question Bank, one marks with answers and other Study materials as well. The link also As Rajasthan 10th Previous year Question papers . Students can click on below link to access all study materails freely.